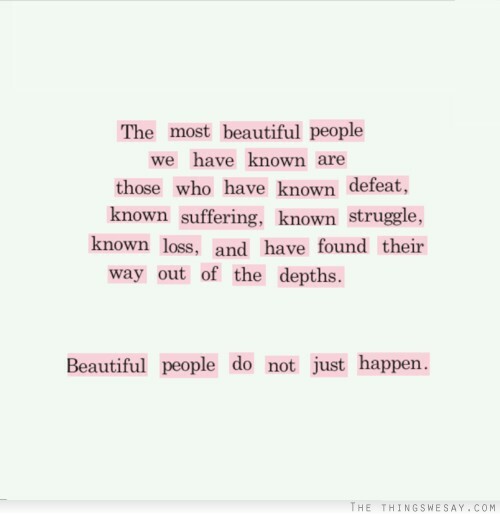 The most beautiful people we have known are those who have known defeat, known suffering, known struggle, known loss, and have found their way out of the depth. I came across this motivational quote the other day — I can’t say if someone of notoriety said this or if it was a person who had insight into the human condition. Either way, I like it very much. I think it may come from a fundamental belief that when something is too easy we are given nothing for it, and although I will admit I may be misguided with this simple premise, I don’t believe we grow when something is too easy. We are hardwired for struggle when we come into this world and it’s the struggle that is the blue print for our growth and success — having it too easy isn’t holistically in our best interest. As a species we have done an extremely good job of controlling our environment and minimizing the historical struggles that came with day to day survival (the spectre of famine, war, disease, or the wrath of mother nature). I’m not suggesting that these still aren’t very real for people but I will suggest that in North America, for the most part, when someone says they had a day where they really struggled, they are not referring the four horsemen. Black and white; good and bad; right and wrong, love and hate, sweet and sour… hard and easy. More and more we seem to think in absolutes, whereas it’s really about the spectrum between these opposing extremes; it is the struggle that happens between the two polar extremes where our growth and strength can be found. And as the quote suggests, it is only in that struggle that you will ever become all you can be (aka beautiful). When it’s easy there is no effort but when it’s a struggle there is effort, strain, creative thinking, adversity, development, defeat, understanding, and victory. It may just be me, but I just don’t see the beauty (or adventure, for that matter) in something being easy. And as I think about it, I think it also applies to familiar, controlled, comfortable and predictable. Although, as I said, I may be misguided. Moments — the beauty that's in a pause. Sometimes, if you happen to take the time to look, you may see something that will cause you take a moment and pause — and in that pause you may simply take the time to appreciate what you are experiencing, or take the time to wonder, or to question something, or even change the way you think about the world around you. The beauty of the pause is not only what you are able to see in the moment but it’s also in the act of pausing itself. In pausing, you give yourself permission to be part of a world that is infinitely bigger than yourself, and offers perspective to what you call existence. I was on a dock (on a lake) just watching a sunset — all something I’ve done countless times. This moment though had me pause and capture it, reflect on it, and share. Why did this moment cause me to pause? Was it because I hadn’t seen something so beautiful before, or was it because I hadn’t seen a sunset with such reflections, or was it the colours? Whatever the reason, for the rest of the night I was pausing to consider the setting of the moon, the abundance of the stars, the joy of being with good friends, and the sounds of nature all around us. I think as I watched the sunset I discovered holism. PS : ho·lism [ˈhōlˌizəm] NOUN — the theory that parts of a whole are in intimate interconnection, such that they cannot exist independently of the whole, or cannot be understood without reference to the whole, which is thus regarded as greater than the sum of its parts. Holism is often applied to mental states, language, and ecology.